When you configure Quality of Service (QoS), you must consider the following variables. The number of network interface cards (NICs) that are installed on the server computer. Whether or not each NIC is dedicated to a specific workload or is shared by multiple workloads. Whether NICs are teamed with the NIC teaming feature. The number of NIC teams that you configure on the server. Whether you plan on using offload technologies like Single Root Input-Output Virtualization (SR-IOV) or Remote Direct Memory Access (RDMA). The following sections examine a few common server configurations and illustrate where QoS can be enforced. This configuration prioritizes the separation of the host traffic from the guest traffic. In this document, the term management operating system refers to the operating system of the computer upon which you are running Hyper-V. The following illustration depicts this configuration. With this configuration, you can apply all QoS features, including Bandwidth Management, Classification and Tagging, and Priority-based Flow Control, as long as the feature is supported by the NIC. The following code, which is run in the management operating system Windows PowerShell environment, provides an example of creating this configuration by using Windows PowerShell. In this code sample, the lines that begin with a number or pound sign (#) are remarks that explain the code in the subsequent line. # Use the inbox filter to capture all the rest of the traffic. You can also enable Bandwidth Management on the Hyper-V Virtual Switch for each individual virtual network adapter. The following code presents an example of how to create this configuration. Optionally, if a VM is trusted – such as in an enterprise environment where you can trust the Administrator of the VM - you can enable QoS classification and tagging from within the VM. The following code, which is run in the Windows PowerShell environment on a VM, presents an example of how to create this configuration. This configuration prioritizes high availability for all of the workloads on a computer that is running the Hyper-V server role. You can enable Bandwidth Management on the Hyper-V Virtual Switch for both the VMs and the workloads in the management operating system. The following example commands are run in the Windows PowerShell environment in the management operating system. Optionally, you can classify and tag traffic from within the management operating system and, in a trusted environment, from within the VMs. # doesn’t require to be tagged. # to let the Hyper-V Virtual Switch pass such DSCP tagged traffic. This configuration provides separation of the host traffic and the guest traffic, as well as high availability for all the workloads. This configuration doubles the required number of NICs to four, but they do not need to all be 10 GbE NICs. For example, if a server has a dual port 10GbE NIC and two 1GbE LOM ports, you can team the two 10GbE NICs for the management operating system and the two 1GbE LOM ports for the VMs. For this configuration, you can use the same Windows PowerShell commands as those provided in the section 2 NICs without NIC Teaming. This configuration emphasizes the use of RDMA. To converge other workloads such as Live Migration, Cluster and Management on the same RDMA NICs, the NICs must also support Data Center Bridging (DCB). 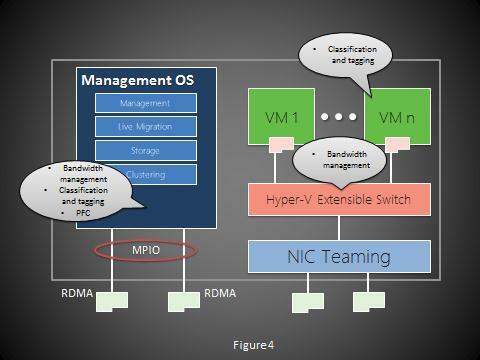 To provide high availability to Storage, you can enable Microsoft Multipath I/O (MPIO). With this configuration, you can apply all QoS features, including Bandwidth Management, Classification and Tagging, and PFC in the management operating system. # left for all the rest of traffic in the management operating system. # NICs) of all the links. 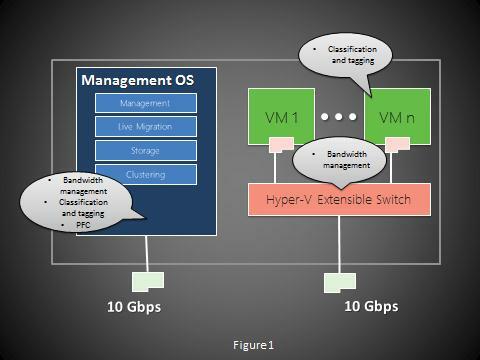 You can enable Bandwidth Management on the Hyper-V Virtual Switch for the VMs and enable Classification and Tagging on the VMs, if they are trusted. MPIO provides redundancy to Storage only. If you want to provide redundancy for Management, Live Migration, and Cluster you can modify the previous configuration slightly as follows. 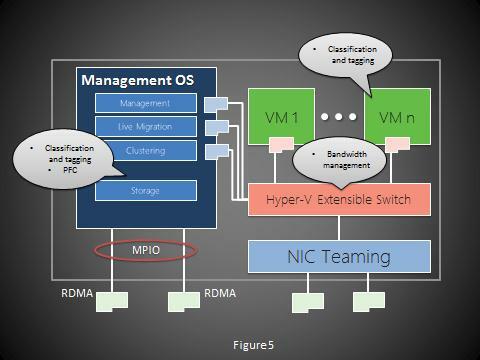 Because the RDMA NICs are dedicated to Storage, no Bandwidth Management is required in the management operating system. 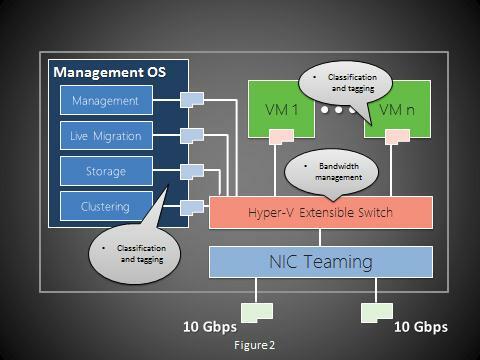 Minimum Bandwidth and Maximum Bandwidth are instead configured on the Hyper-V Virtual Switch because Management, Live Migration, and Cluster each have their own virtual network adapter that is connected to the switch. You can enable Classification and Tagging and PFC in the management operating system. You can also enable Classification and Tagging from within the VMs, if they are trusted.